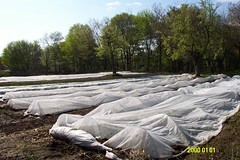 Cover crops help us begin to replace the tons (literally!) of organic matter taken from the fields during the growing season. Tons (again, literally!) 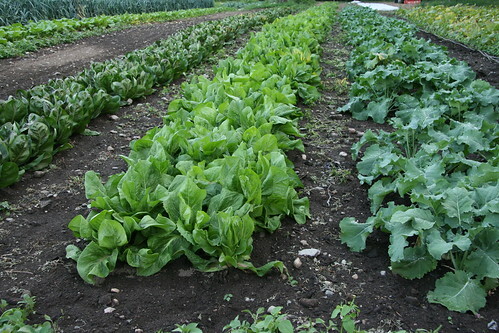 of compost will also need to be spread before the next growing season if we are to even approach replenishing the soil. 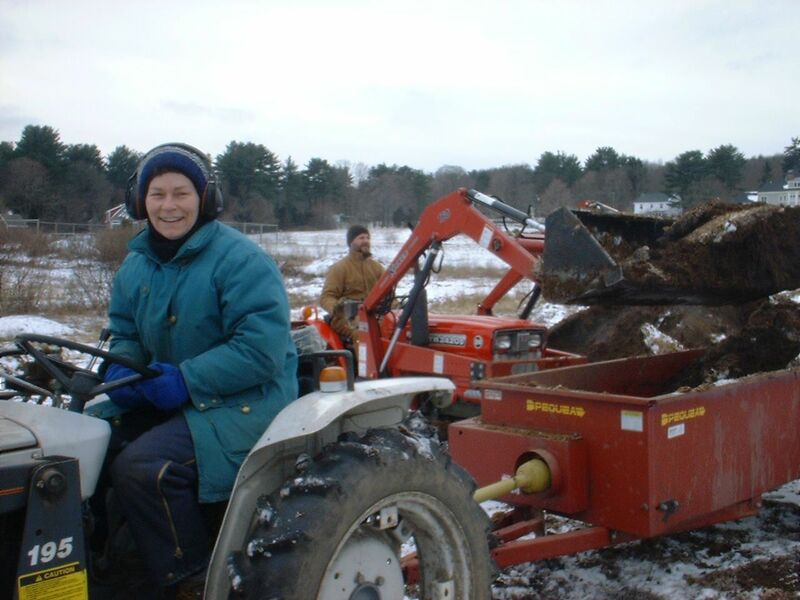 As you may be able to tell from this old photo of me spreading compost with CY at Vanguarden CSA, I like this winter work! 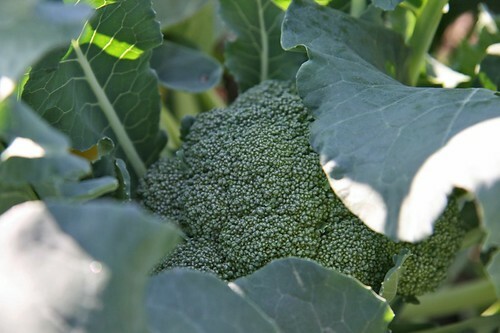 Oats were undersowed in the cabbage, broccoli, cauliflower, kale and collards at Brookwood around the first of September. They are coming up nicely. The oats will continue grow amidst these ‘cash crops’ until the first hard frost which will kill them. 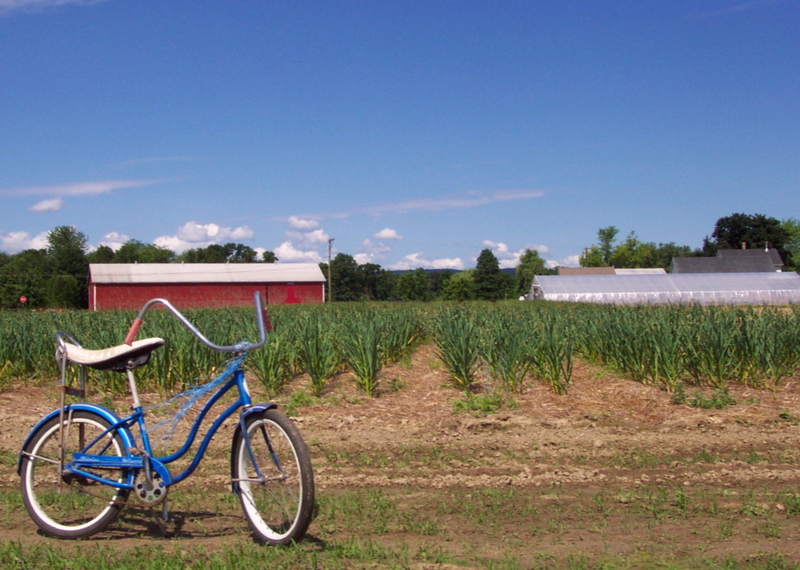 In the spring, the oats will be tilled in and the first crops of 2010 planted in their place. Undersowing is a useful cover crop technique on a small farm like Brookwood. 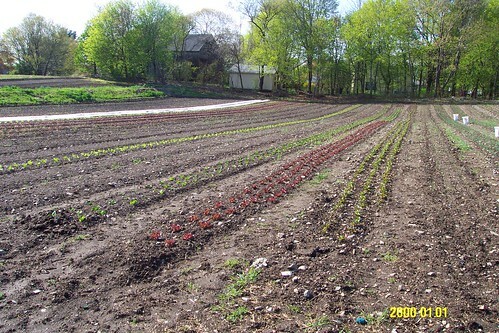 It allows us to protect and replenish the soil at the same time we’re using it to grow late fall crops. In hindsight, I wish the oats had been applied a bit earlier, when the crops were a foot in height rather than two. It would also have been lovely to use the Cub for the final cultivation/mixing soil and seeds. I’d hoped to undersow our winter squash planting with hairy vetch, but we missed the planting window because we didn’t have the seed on hand. (Note to self, order cover crops in the spring!) 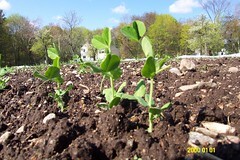 It’s best to undersow vetch just as the squash vines are reaching across the tire tracks, into neighboring beds. (It’s handy to sow it just before a rain, too.) Vetch is a legume; it pulls nitrogen from the air and brings it into the soil where it’s available for next season’s crops. I think we’ll be able to make good use of the vetch next week, mixing it with oats and applying to the beds where the melons grew this season. We took the last of the tomatoes down today. Moved tomato stakes to their winter resting place. Mowed the pepper and eggplants. Used the disk harrow to chop up the plant debris and get the field ready for winter rye. It was a bit odd, though pleasant, putting the farm to bed on such a summery day. Much of my field is in cover crop now. Oats and field peas are growing where I’ll plant first next spring. Winter rye will be sown early next week. 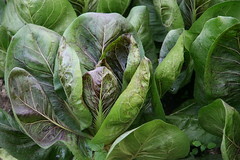 Leafy greens that I’m growing for the Winter Share are lovely. Kathy stopped by to take photos. She makes the field look like a piece of art. Hmmm, maybe it is! 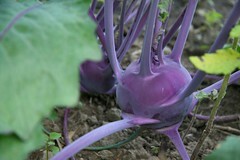 The kohlrabi and broccoli were planted a bit late and the fertility in their beds isn’t so great. 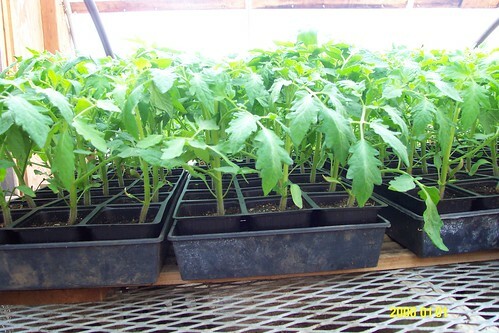 I’m not sure they will size up enough to harvest for the October winter distributions. We’ll see. Or maybe I should write, “dirty vegetable farm”, ‘tho we girls did get pretty dirty during the harvest. 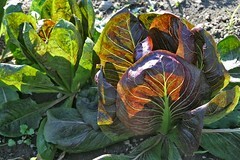 The lettuce we harvested this morning for the CSA had more soil on it than usual. 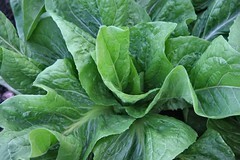 The much needed rain earlier this week — about an inch on the farm — came down hard, and it splashed a lot of soil onto the lettuce. 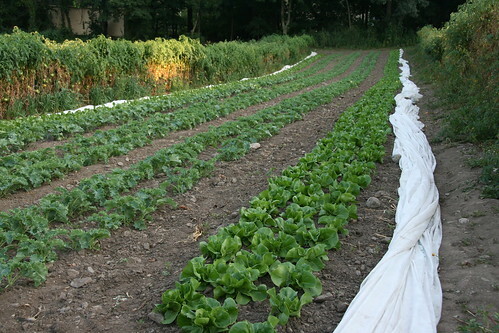 I dunked the lettuce and gently sprayed it and dunked it again, but I think some of my shareholders took home something more precious than fresh veggies today: healthy soil. Speaking of healthy soil, in year three of my growing food on this acre, the earthworms have returned. During my first two years, the rare earthworm sightings created excitement and always led to conversations about their absence. 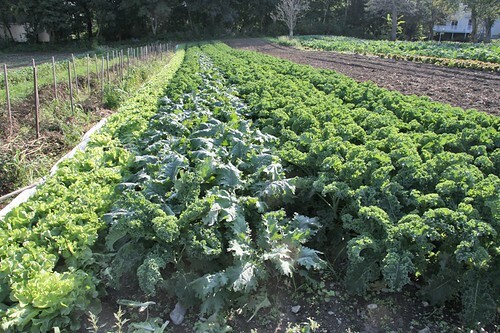 Some growers I spoke with suggested that the conventional fertilizer long used on this land may have created a caustic environment for the worms. Others wondered if the deposits of grass clippings from local landscapers may have contained chemicals that were not earthworm-friendly. I’m not sure if either of these hypotheses is true. But after two years of organic fertilizer and a heavy application of composted manure, there are earthworms everywhere!